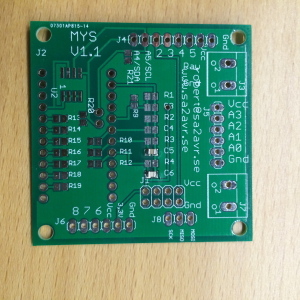 Mys 1.1 is a general purpose baseboard for use in a MySensors network. To make it a complete sensor or gateway you also need a nrf24L01+ radio module and an arduino pro mini module. 5V or 3,3V on connector J7 depending on what pro mini you are using. through usb to serial port adapter but it has limited current. Use only one of them at the same time! R1-R21 10×4.7K (472) 4x1K (102) 4x10K (103) 4x120k(124) Resistors included see assembly instructions. J2 2 pieces 12-pin female headers + 1 piece 2-pin female header. 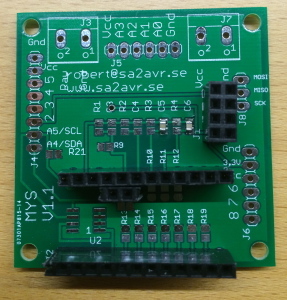 Solder C1,C2 and U1 on bottom of board if you are using a 5V arduino. 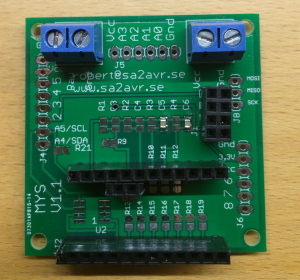 If you use a 3,3V arduino you can make a jumper between Vcc and 3,3V on header J6 or bridge Vcc and 3,3V pads on U1. 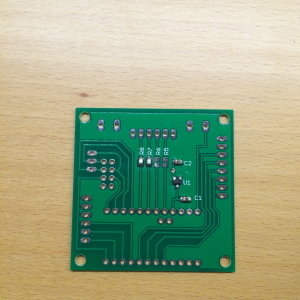 Solder all resistors on top of board that you need depending on application. R1-R4 pulldown for A0-A3. 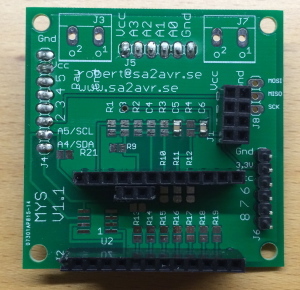 R5-R8 on bottom of board, voltage dividers for A0-A3, bridge if not used. R9-R12 pullups for A0-A3. R13-R19 pullups for D2-D8. R20-R21 pullups for A4-A5. Also solder C3-C6 if A0-A3 is used as analog inputs. Solder U2 if used (not included in kit). Cut and solder headers J1 and J2 or solder radio and arduino directly on board. Solder J3 and J7 if used. Cut and solder J4-J6 and J8 if used. They can be mounted both on top and bottom side. Check for shorts between Vcc, Gnd and Raw. Plug in your Arduino with a mysensors sketch and radio. 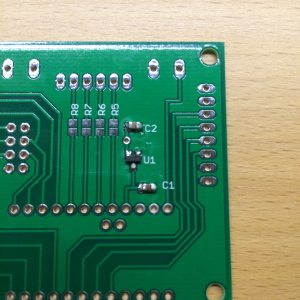 If you connect a 10K NTC temp sensor or LDR between gnd and A0 you may need a 10K pullup on R12 and bridge R8. If you want to meassure a voltage 0-24V on A1 you need to divide it with 120K on R7 and 10K R3. If you connect a DS18b20 temp sensor to pin 2 you need a 4,7K resistor on R13. 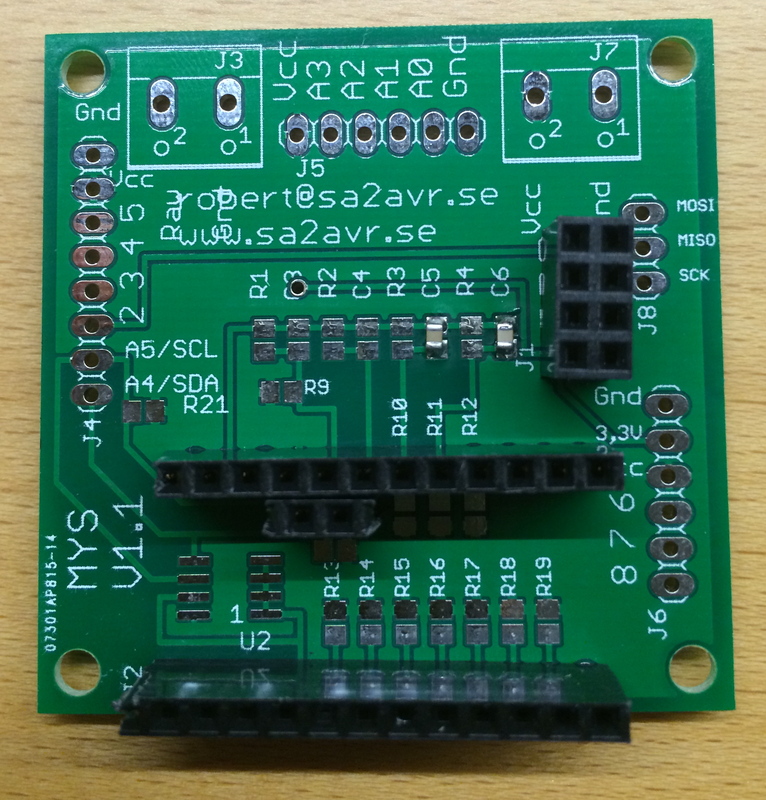 If you want to use I2C you probably need 4,7K on R20 and R21. If you connect a indication LED between A2 and vcc you need a 1K on R6.